An article by Corey Jensen. Upswing Lab member Shaun 'shaundmaster' Densmore has just a few years of serious poker experience under his belt, but he has already made strides toward becoming a very successful online tournament player. Routine study and a sensible playing schedule have resulted in several notable finishes for Shaun, but most recently he finished second in the PokerStars Sunday Million for a whopping $94,901.70. What's more, Shaun was in the tournament for just $7.50, accomplishing the tournament grinder dream of parlaying a small satellite buy-in into a massive win. "I find [Doug's] explanations really easy to understand. But every Lab instructor is great in their own way." In fact, anything better than eighth place would have given Shaun his biggest score to date. Prior to the Sunday Million, and prior to joining Upswing Poker, his best finish was second place in another PokerStars tournament for $9.3k. Needless to say, a deep run in the Sunday Million feels very different. Nearing a spot at the final table, he recalls being "in shock" at what was happening, but that he was able to keep his mindset in check: "I remember telling myself, this is just a 9-person sit-n-go now. All you have to do is keep playing solid poker, and don't let these guys push you around." Even with such an impressive score, Shaun's poker career is refreshingly true to life. By his own admission, he is a poker "hobbyist," with a day job and a family to care for, and so he has no immediate plans to pursue poker full time. "I'll take a little time to enjoy the score and soak it all in… I don't think I'm quite ready to pursue poker full time. I'm mostly hungry to learn and continue improving first." Indeed, Shaun exemplifies the modern recreational player, trying to navigate a poker landscape that looks very different than it did ten, or even just five years ago. With other, 'real life' responsibilities to worry about, his poker success depends on time and money carefully spent on quality poker training, and involvement with a network of peers who share his goals and motivations. Toward these ends, Shaun joined the Upswing Lab back in December of 2016 (a generous Christmas gift from his wife). Since then he has been reading and posting in the Lab members’ Facebook group on a daily basis, and he credits his membership with helping to identify and plug serious leaks in his game. More specifically, Shaun notes that he was "under-bluffing, and relying too much on premium holdings in order to gain chips (which we know doesn't happen often enough over the long run to sustain a bankroll)." To correct this, he "learned how to recognize spots where [he] should be bluffing instead of just checking down, for instance, or checking and then folding to an opponent's turn stab, etc." He also points to the "WSOP Tune Up" series as his favorite section in the Upswing Lab, which helped sharpen up his short- and mid-stack play. "No matter what happened from that point on, my life had changed… poker dreams can become reality." Undoubtedly, many aspects of Shaun's game were put to the test during his Sunday Million run. For instance, he made a fairly tough call late in the tournament with against an opponent's 3-bet shove for twenty big blinds. A less experienced Shaun might have folded in that spot to avoid a likely flip, not understanding how crucial it is to seize upon opportunities to chip up when having chips matters the most. Having learned to play for the win, Shaun called, his sevens held against his opponent's , and he jumped to third in chips. Every tournament is filled with decisions (and flips) like this, which can mean the difference between running deep or busting early. It's also clear from Shaun's retelling of the Sunday Million that he makes game-time decisions with confidence—something many players can’t do for lack of preparation and strong fundamentals. (Shaun perhaps draws inspiration from one of poker's most confident players, Doug Polk, who also happens to be his favorite Upswing Lab instructor: "I find [Doug's] explanations really easy to understand. But every Lab instructor is great in their own way.") And confidence is of course best cultivated by studying hard and learning to use the tools of the trade. Shaun, for example, notes that he has "pretty much memorized" Upswing's range charts using the Preflop Chart Viewer (pictured below) in the Lab, and that he now feels comfortable playing without them. Ultimately, Shaun's Sunday Million run would end when his Ace-Queen ran into OMGRubCasco's Ace-King—a pretty ordinary bust-out hand. 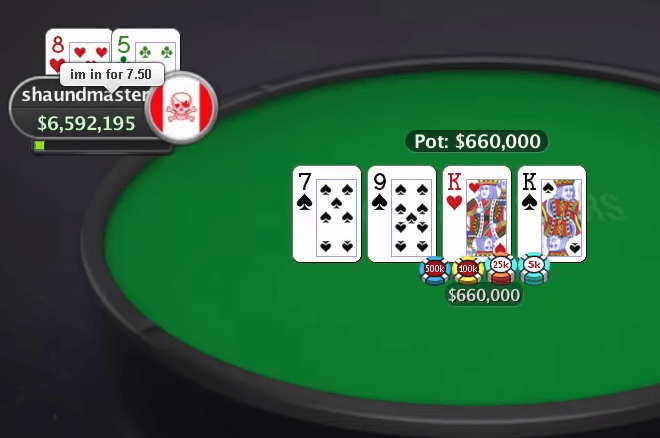 More memorable is a charming moment from heads-up play when, fatigued, relieved, and simply overjoyed to have made it to the final two, Shaun announced in the chat that he was in the tournament for just $7.50. He recalls wanting anyone watching to know that a poker "hobbyist" had just turned lunch money into a small fortune. "No matter what happened from that point on, my life had changed… poker dreams can become reality." Indeed, Shaun's success is proof that hard work paired with quality training produces results. You can read more about his incredible Sunday Million finish here, and if you haven’t done so already, visit the Upswing Lab today to explore for yourself the in-depth strategy content that got him there. Note: You would love to turn your poker hobby into a profitable side hustle, right? Start crushing your competition with expert strategies that you’ll learn inside Upswing Lab. Learn more now!